At first glance this looks like an intimidating piece of equipment. It stands so tall that it looks like hard work to even get it on your back. I was stunned when I first lifted the frame of the Deuter Kid Comfort III – it was light as a feather compared to its size! The comfortable and intuitive design makes it very user-friendly and a pleasure to use. The only real issue I experienced when reviewing the carrier was that my boy was so excited to be sitting up there in the cockpit that he was yelling right in my ear half the time! It is impressive just how soft and comfortable the padding is on the back, shoulder, and waist straps. The material is very responsive to movement and once strapped in hugs tight to your body at all times, yet it feels very breathable. The straps are all fully adjustable and will accommodate a range of sizes. We have tested this with wearers from 5ft 1″ to 5ft 11″ and as long as the person can physically handle the weight then the size of the straps and frame should not cause a problem. Mobility may become limited the smaller you are though. The waist pocket was just able to fit an iPhone in there, but it was a tight squeeze. My wallet also fit, but they didn’t fit at the same time. So your storage space within reach is limited. At the back of the carrier there are two levels of storage pockets. The base is the larger one and is deceptively deep. I was able to fit my arm in all the way to the elbow. Plenty of room for lunch, and some warmer clothing. The pockets higher up are only shallow but ideal for those smaller bits and pieces that you need to access quickly. Like diapers and wet wipes. Your little one will slide in fairly easily as long as they are in a cooperative mood. I would encourage you try and connect the five point safety harness before you put your child. Once they are in it can get a bit tricky due to the middle buckle almost appearing as two halves that clip together. You can loosen the side panels on either side of your baby to create more space to get them clipped in if you need it. Once they are secure you can then tighten up those side panels again creating a secure and enclosed space. The cushioned chin rest was too hard to resist for my little guy. He chewed and rubbed his face on it non stop. No rashes on his face, and no wear and tear on the cushion material itself. I can see this getting a bit grubby over time if he doesn’t lose interest in it. But it is a great safety feature if he were to jerk his head forward while on the trail. The quality of material is consistent on the underside of the seat and is just as soft and comfortable for your toddler to sit on. The canopy can be folded back entirely and secured inside a zipped up pocket when not in use. I was initially concerned the canopy would impede the view too much. But my boy did not seem concerned at all and continued to look around at the views without issue. There is an additional cover (pictured) that you can place over the top of the canopy if the weather turns bad. As you can see this does impede the view a bit more, but if you are trekking through high wind or rain then the additional protection for your baby is a must. This is fully removable and sits in one of the pockets when not in use. There is a centre handle at the top of the back area that is very strong. This allows for a simple one handed pickup. Even with a toddler inside the weight is manageable – in this case he was around 35lbs. After lifting, place the opposite arm inside the first shoulder strap and maneuver the carrier behind you until you can reach your second arm through the second strap. You need to be careful doing this to keep the carrier as upright as possible. While your baby is strapped in pretty tight, you don’t want to scare your little one while in motion or they may be screaming to get out pretty quickly. Fortunately in my case the little guy was having a blast! Once your arms are strapped in you can clip in the chest strap. This prevents your shoulder straps from moving around and keeps the weight distribution stable. Oh, and remember to pull in the kickstand when you are upright so this does not get caught on anything. I could reach this well enough, but I just kept forgetting to do it. 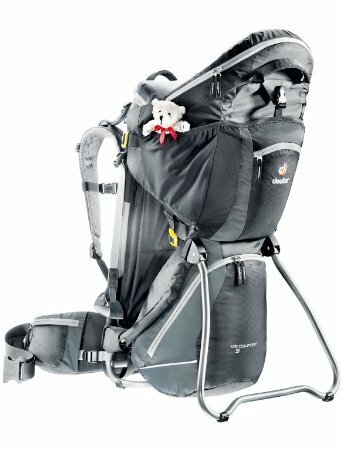 If you are not afraid of spending a few extra bucks to get the most comfortable carrier possible this the Deuter Kid Carrier is a great option for those looking to take long day trips. If you have ever tried a long hike with an uncomfortable back pack then you will probably not flinch at the extra cost. Once your baby has full neck control they will be able to sit in the cockpit and enjoy the ride for many years to come. Even though there’s a footrest, the child cannot propel itself in a standing position while you are carrying them on your back. The sunroof is integrated to the design. The pillow drool pad will allow your baby to fall asleep on a hike and still be well supported. It comes with a pocket rear view mirror so that you can monitor your passenger anytime you want. The side-pocket located at the side of the hip belt is too small to fit some smartphone models. You need to take the pack off if you want to access the storage areas. The full rain cover is not included in the set. You need to buy it separately. The Deuter Kid Comfort III is the head of its class in hiking/backpack carriers. The keyword for this carrier is comfort for both you and your baby. This hiking carrier feels like it is working for your body and not against it, and will greatly reduce fatigue and the risk of injury on a long day out. It follows the normal rhythm and movement of your body. The VARIFIT and the VARIFLEX system integrated in the design of the carrier is impressive. It also keeps your child in the correct seating position preventing any injury or unwanted effects of backpack carrying your child. The head is properly supported. The hips are in place and the back is properly aligned. This backpack/hiking carrier is a splurge, but if you’re an avid hiker then consider it an investment. Your days will be far more enjoyable with this carrier and your body will thank you in the long run. The comfort that you and your child will get in this carrier is superb. It is a well-made carrier that is durable, functional and safe. While the frame is stable and the buckles and harnesses are robust, parental monitoring is still required whether your child is on or off the carrier. Check out our full list of Hiking Carriers here.